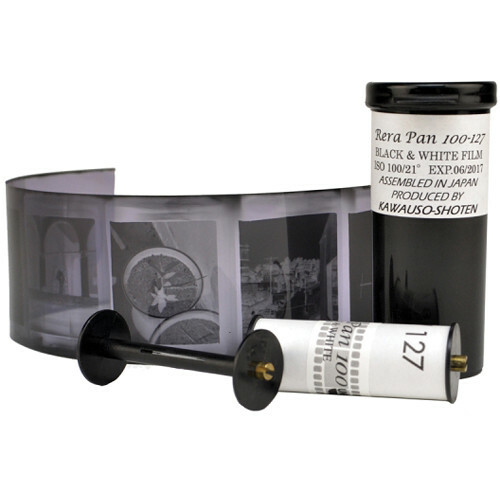 Designed for 127-format vintage film cameras, this roll of ReraPan 100 Black and White Negative Film is a medium speed film for producing prints using a traditional black and white printing process. It exhibits a nominal sensitivity of ISO 100/21° and standard development in black and white chemistry yields a fine grain texture with even tonality. Nearly a forgotten format, this film offers a unique ability to once again work with 127-size film cameras to produce 4 x 4cm and 4 x 6.5cm-sized negatives. This film is highly sensitive to ambient light and should be loaded and unloaded in subdued light. It is rolled onto plastic spools. Box Dimensions (LxWxH) 3.0 x 1.2 x 1.0"
ReraPan 100 Black and White Negative Film (127 Roll Film) is rated 4.8 out of 5 by 20. Rated 4 out of 5 by Airplane1969 from Excellent 127 film! This film has developed excellent negatives and produced beautiful photographs. Rated 5 out of 5 by Charles from Great to have this film available for 127 shooters! For 127 film, there are precious few choices available, and this is a good one fortunately. The film itself is certainly satisfactory; the grain is pleasant and it developed normally and with good contrast in Rodinal diluted 50:1. I like the relatively-slow ISO of 100, since many vintage cameras struggle with faster films. I have some cameras (not specifically 127 cameras) which top out using 400 film in bright daylight, for example. I would not buy this film if it were ISO 400. Be aware that you quite likely will be developing this film yourself. The film is rolled very tightly on that little spool and it is very curly when you unroll it in your darkroom. I highly advise buying a spare roll and practicing with it so you can load in on your reel the right way! I had a lot of trouble the first few times. Rated 5 out of 5 by freemat from great results Tried this film out in a Baby Brownie. The little camera was so dated that I could hardly see out of the viewfinder. Yet, the images came out so crisp and clear. Loved the results. Rated 5 out of 5 by Anonymous from Great! This is definitely the film I had been looking for! The camera I have only takes 127 film, which isn't easy to come by in stores, so I'm thankful BH had this type, as well as the different colors. Black and white is classic and it looks great! Rated 4 out of 5 by Mike in Midwood from Guessing game Im very happy with the film and its picture clarity. At first though, I wasn't sure if there were numbers to identify how much to wind the film so you dont overlap in exposing the film. It had me guessing how much to wind everytime. Then after a couple shot and guessing a number appeared on the back of the film. I wish the product would have said on the box me that it was labeled instead thinking im rolling out all my film or now my pictures are going to come out bad. Otherwise it's a very good product and I'm happy with the purchase. Rated 5 out of 5 by Allan from The Best 127-format Black & White Film at B&H ! We were days away from setting off to climb Everest and for the life of me I couldn't find film for my beloved 1936 Kodak Bullet. Then my wonderful Miss Muffy said Why don't you go to B&H? - and so I did. While on Everest I managed to finish the entire roll - all 8 pictures! Dropped the film off at the drug store earlier and asked for deckle-edged glossy prints - cannot wait to share the results with my darling Miss M.
Rated 5 out of 5 by wiz from Awesome Film Really impressed with this B&W film. Black blacks, white white whites and rich grays for a great dynamic range. It like a T-Max 100 for 127 cameras. I know this film is hard to find. Is this newly manufactured film? I'm searching for this particular film I have been told by many that this film is no longer made and that anyone selling it is selling old out of date film that may not even work. I just want to make sure that if I am spending the time to try the old camera I found that the film will work properly and I will know if the camera has any sort of malfunction or light leak. Thank you. B&amp;H buys and sells film in bulk. In general we regularly maintain fresh film stock. All of our film is at least 6 months from expiration (typically much longer). Anytime film stock is less than 6 months from expiration we sell it in a separate section and label it as short-dated film and also price it with a slight discount (again due to the volumes we sell this rarely occurs). Unfortunately we do not have access to our inventory to hand inspect the expiration date of any of our films prior to purchase. Will this film work for a Kodak Brownie Fiesta? The manual suggests Kodak No. 127 (Verichrome Pan Film, Kodacolor Film, or Kodak Ektachrome Film for Daylight). Yes! This is the fil you need! It is one of the only films available for that type of camera. Is this film produced 127, or is it professionally cut and re-spooled? Not sure it worked fine with my vintage camera. The backing was 127 not cut down 120. Hello, will this film work for a Beacon II camera? My dad recently gave me one he bought in junior high. Any tips about its use? According to a simple web search this camera uses 127 roll film. No tips though as I am not familiar with this camera. Have you tried to search for the manual or user guide online? Will this work in a vintage Brownie bullet camera? Does this work with a vanguard spartus camera? I use this in a Kodak Holiday Brownie and works fine. How many exposures does 127 film have? Can this film be pushed? My apologies but I do not know specifically since I have not done that with this film.